For those of you who know me in person, or fellow designer makers I keep in touch with, I know a few of you have noticed that my online shop has remained un-updated for the best part of a year, and before sharing some new work I have with you, I wanted to give a bit of the story into why my ‘business’ doesn’t run in the usual way, with product ranges that remain constant, and a host of fairs and events or exhibitions under my belt each year. This is because, this year it took me 10 months to source yarns that met my ethical criteria. Being a knitwear designer with no yarn to knit with is quite tricky. If you’re familiar with my work you’ll know that I only use yarns which meet several criteria in terms of traceability, animal welfare, sustainability and fair trade, which are some of the broader umbrellas under which my yarns sit, and they are part of the solution to specific issues under these umbrella terms. You can read about these criteria on my ethical knitwear page. Within these criteria, there are a number of avenues I can pursue in order to track down my yarns, and this is where the time this year came in. I’ve noticed, with enthusiasm, an increase in interest from other designer makers in ethical sourcing of their materials, and also, the ever growing ethical fashion community who make up a still surprisingly small, but mighty, community who quite rightly demand facts and transparency, which I am really happy to be able to give, and so I’d like to share a bit about what is involved in my process of ethical sourcing. Since finishing my one retail show of the year last November, and finding that my supplier of traceable, British, single farm alpaca was no longer going to be supplying yarn, 90% of my time has gone into the sourcing of my yarns, back and forth emails and calls to leads I’ve had on smallholdings that I’ve heard about through word of mouth, looking into working with mills, working on the best way to include colour in my work in terms of dyes and who to work with on that, and going around multiple yarn fairs asking every vendor about slaughter free yarns and traceability. 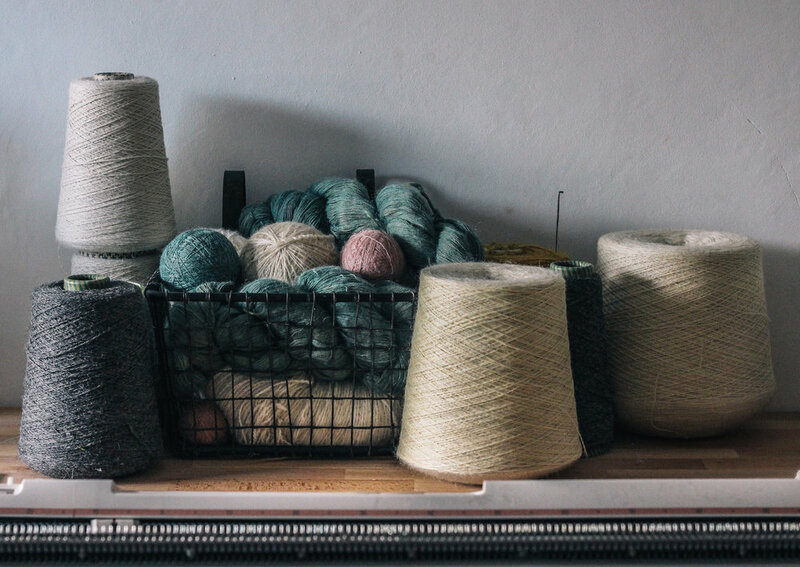 It took me roughly these 10 months of this year to end up with some cones of yarn finally making their way to my studio, and also in that time, I’ve been observing the tussle of opinions over wool as a sustainable material. I have some thoughts on this, which I hope are measured but that I am sure are not all inclusive of the complicated issues around this, and I’d love to hear more from you on these topics too, and for this to be an evolving part of my work which is an open conversation. Alongside my surprise new full time job of yarn sourcing, not knitting, I saw one of Kristen Leo’s informative videos, where she shared information really accessibly about the most harmful materials in the fashion/textiles industry and talked about some of the issues with wool. I’m a huge fan of Kristen’s work, how she shares information about so many different areas of ethical fashion and is an advocate and ambassador for change. I watched her video with great interest as she included several concerns about wool, all of which I share, but that happily, none of which affect the yarns I work with. It was another catalyst for me wanting to open up a conversation around this, the use of wool is a specific part and perhaps a part of the fashion industry nightmare that might seem small, but that I’ve found myself addressing very specifically, and that I’ve found to be one part of a domino effect that could improve the current fashion industries complicated and overwhelming web. It’s one small part that I’ve seen and thought, actually we can fix all of those issues, and if we try to find solutions for one thing at a time, that’s where I believe the huge improvement that we’re already seeing is coming from. I think it’s vital to solve the ethical issues with wool, given that, unlike leather and Pinatex for example, there are currently no alternative materials with the same qualities as wool, and ‘wool’ alternatives that are being used are causing a knock on effect of huge environmental issues (e.g. acrylic, more on this in an upcoming post). So in the coming weeks I’m going to be sharing some information, probably far too long and detailed, about why the yarns I source aren’t affected by the issues mentioned in Kristen’s video, which include mulesing, wool as a meat by-product, mass production, and affordability. This last issue, I do agree is a real and problematic one, there’ll be more on that to come. I was going to start by sharing some of my thinking about that now, but having accidentally written 4239 words about affordability and ethical products, I think I’m going to come back to that! I thought a good place to start instead, is by sharing with you my Yarn Line Up for my products this autumn. It feels very siginificant to share these yarns with you, the product of the best part of this years work, I hope you’ll appreciate them as much as I do. Slaughter and cruelty free, single farm, traceable Wensleydale from Richmond, North Yorkshire. The yarn is spun in the UK and sent to me directly from the farm. The photo story from my visit to the farm is coming soon, as part of my Scarf Story project. The yarn is in it’s natural colour, undyed. I found Isobel, of Izzy Lane, who has supplied me with these yarns, shortly after graduating, just by a quick google of ethical knitwear designers. I identified with so much of her process, the struggles of finding yarn that met her criteria, so much so that she’d decided to keep her own flock of sheep, and sent an over excited email to her asking if I could use any of her yarns, she said yes, and I’ve been getting yarns from her ever since, in whatever weight or colour she has at that time, as I love to support her efforts and include these wonderful yarns in any way I can. Slaughter and cruelty free, single farm, traceable shetland from the same farm as the Wensleydale, in Richmond, North Yorkshire. Again, the yarn is sent to me directly from the farm, and this natural, undyed shade was used in some of my new scarves. I also wound this yarn into skeins and sent this directly to my natural dyer Paula Goosen of Moel View Yarn, to be dyed to my bespoke colours. Naturally dyed Shetland - Slaughter and cruelty free, single farm, traceable shetland from Richmond, North Yorkshire. The yarn is sent directly to me from the farm, I then wound it into skeins by hand using a niddy-noddy, and sent to Paula Goosen of Moel View Yarn, who dyed this shade using indigo. Her indigo is sourced from responsible suppliers in Jaipur, India. Hopefully next year I can get an electronic yarn winder. I first remember finding Paula through my knitwear tutor Sarah Elwick’s instagram profile, and noticing her wonderful packaging design incorporating the welsh mountains she’s surrounded by. I remember commenting on her photos about how much I loved her packaging and followed her ever since. When I needed to work with a natural dyer this year, she instantly came to mind, and I’ve been so excited to work with her. Naturally dyed Shetland - Slaughter and cruelty free, single farm, traceable shetland from Richmond, North Yorkshire. The yarn is sent directly to me from the farm, I then wound it into skeins by hand using a niddy-noddy, and sent to Paula Goosen of Moel View Yarn, who dyed this shade using black tea and lac, a substance found on the trees that the lac insect lives on in Asian countries, lac is a natural dye used very often for pink and red shades. Paula uses the same tea in her dyes as she does in her cup, Clipper Fairtrade, and the lac is sourced from responsible suppliers in Jaipur, India. Slaughter and cruelty free, single farm, traceable Wensleydale from Richmond, North Yorkshire. 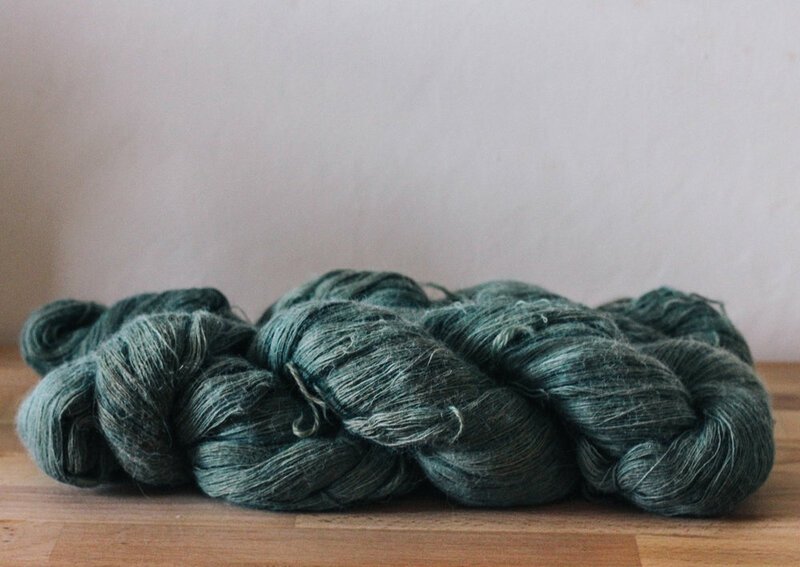 The yarn is spun in the UK and sent to me directly from the farm, and then sent onto Paintbox Textiles, the organic dyeing factory that I work with in Liversedge, Yorkshire. The photo story from my visit to the factory is coming soon, as part of my Scarf Story project. The yarn is dyed to Global Organic Textiles Standards (GOTS) and is Soil Association Certified Organic. I found Keith from Paintbox Textiles again through online searching for organic or natural dye specialists in the UK, and found a company in Cornwall, who’d sold their company to Paintbox Textiles, which led me up to Yorkshire to Keith. North Welsh Alpaca - Slaughter and cruelty free, single farm, traceable Alpaca from Sodom, North Wales. I found Michael and Celia, the couple behind these north Welsh alpaca yarns, a little too late and they have just stopped producing yarns as they are retiring, having kept the alpacas at their smallholding and spun the yarn themselves using ‘mini mill’ equipment for many years. The equipment has been sold on to a smallholding in Shropshire who I’m going to visit in January, so I’m hopeful for more single farm, traceable British Alpaca. The yarn is used in its natural shades of ecru and charcoal. I found out about Michael and Celia through Sarah from Jwrnal, who when interviewing for her Welsh makers project, asked me about whether I would want to use Welsh alpaca, I said of course that I would, but that I hadn’t been able to find a supplier; enter Michael and Celia, who Sarah knew of through her North Welsh circles, and I then visited them at Wonderwool in Builth Wells where I saw some of their yarns and eventually managed to get 4 cones to my studio about 18 months after Sarah had first put me in touch. World Fair Trade Organisation Peruvian Alpaca, shorn by hand from local alpacas and hand spun by the Puskariy Tika Cooperative who are a part of ‘Awamaki’, a non-profit organisation based in Ollantaytambo who support 8 cooperatives of hand spinners, weavers and knitters. The Puskariy Tika cooperative has thirteeen members: Marta, Gregoria, Virginia, Hilda, Dionicia, Francisca, Exaltacion, Simeona, Flora, Paulina, Nicolasa, Benita and Damiana who each spin alpaca yarn by hand as part of their work for the cooperative within the Huilloc community. When in Peru last year I put a shout out on Instagram for anyone who knew of anything textiles related in Cusco, as I found I had an extra day there after travel to Antauta being delayed. Lois replied, a fellow graduate of Fashion Design, who had picked up a postcard of mine at Graduate Fashion Week in 2015, and followed me on Instagram ever since. It turned out that Lois had volunteered for a non profit organisation near to Cusco (in Peruvian terms) and she told me about them, ‘Awamaki’. I messaged their contact email hoping that I would get a reply in time to organise a visit to Ollantaytambo, which is in fact a few hours from Cusco by bus, but timings didn’t go our way and I wasn’t able to get there in time. However, I became entirely enamoured by Awamaki’s work, and got in touch with their founder Kennedy, who kindly agreed to speak with me about my work with 'The Antauta Knitters’. When it became abundantly clear that hand spun, fairly traded yarns from women’s cooperatives takes a very long time to organise (you would’ve thought it would be obvious) I decided I’d love to make things with Awamaki’s yarn, while progress with Antauta was ongoing, as after all, fair trade alpaca is what I was after. After selecting the finest weight I could, Kennedy organised for the first batch of yarn to be sent to me, which arrived with the scent of whatever incense everyone in Peru uses (the same smell I remembered from the room I stayed, the knitting shop I was visiting and everywhere else I went) and having sampled some hand knitted hats, I ordered more which is on it’s way to me as we speak. I’m hoping to visit Awamaki during my next trip to Peru. I will be launching my new web shop, with all products made by hand, using these yarns, really soon. Sign up below to be notified. Sign up with your email address to find out when the autumn/winter 2018 shop update is live.